May 3 and 4th, 9a.m. to 9p.m. May 5th, 9a.m. to 6 p.m. The traveling Tomb of the Unknown Soldiers Replica exhibit will be hosted at Three Rivers Museum. Also on exhibit is the Remembering Our Fallen Oklahomans traveling exhibit from the War Memorial Park in Muskogee. There will be daily lectures such as How to Research your military history., The history of the Girl Scout cookies (as they started during the war and right here in Muskogee. ), The Roughriders and Teddy Roosevelt., The history of the Batfish and more. 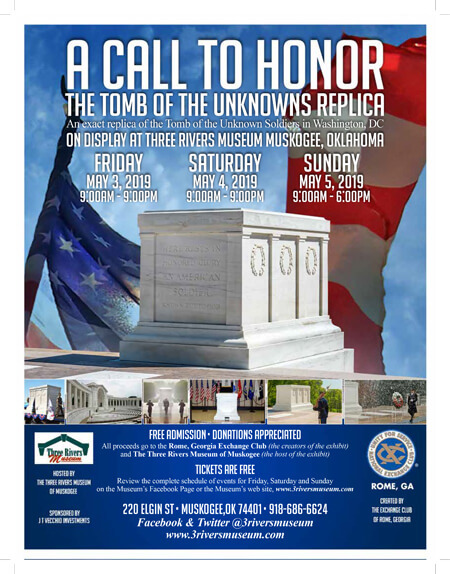 The Muskogee High School AirForce JROTC will present the colors for the opening ceremony at 9:00 a.m. on May 3rd, Follow our website at www.3riversmuseum.com or our Facebook page for schedule and more information. This is a Free event sponsored by JT Vecchio Investments and the Muskogee Chamber of Commerce.